For the past four years, Drayton Hall has represented the Ashley River Historic District in a regional planning effort administered by the Charleston, Berkeley and Dorchester Council of Governments (COG). The plan would guide our elected officials to the best means of keeping our rural and natural areas protected while fostering intelligent growth in our urban and suburban centers. 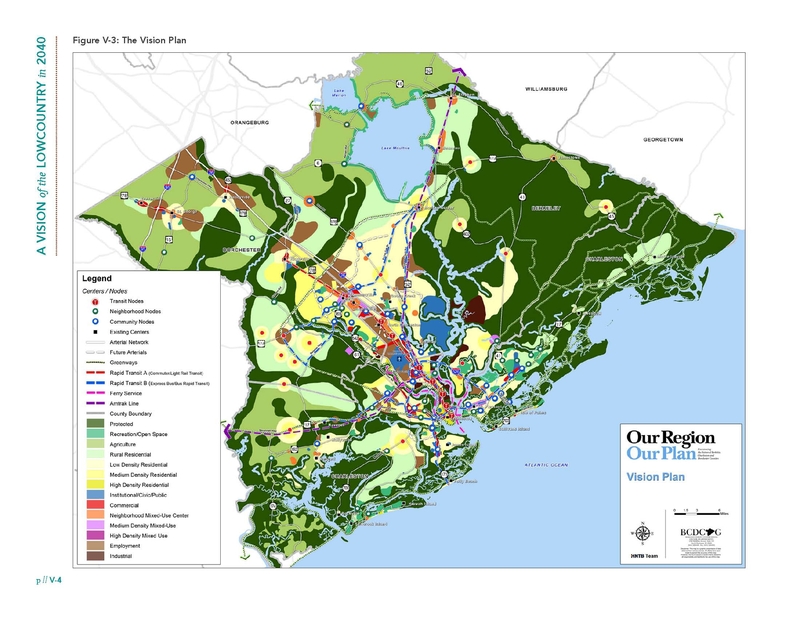 Planners generated models that were used in rounds of public feedback—culminating in the final draft of “Our Region Our Plan.” The Plan, complete with futuristic visualizations of corridors and growth centers, is being presented to all of the different jurisdictions throughout the lowcountry this April. This Vision Plan shows a sustainable path for growth over the next 30 years. While Our Region Our Plan is not a mandate, it offers a working guide for decisions about roads and development that will inevitably be made in order to accommodate the estimated 200,000 people moving to the tri-county area by 2040. Towns, cities, and counties now will have a more integrated picture of their role in the quality of life and economic vitality of the entire region. Decisions about roads and developments in Hollywood affect the residents of West Ashley, and decisions made in the downtown corridor affect residents living all around the peninsula. Most importantly, this Plan prompts the different municipalities and regions to cooperate with each other. A total of five jurisdictions have the power to determine how the land and water around Drayton Hall are managed, so we especially value cross-jurisdictional cooperation when it comes to addressing issues that impact our historic resources. 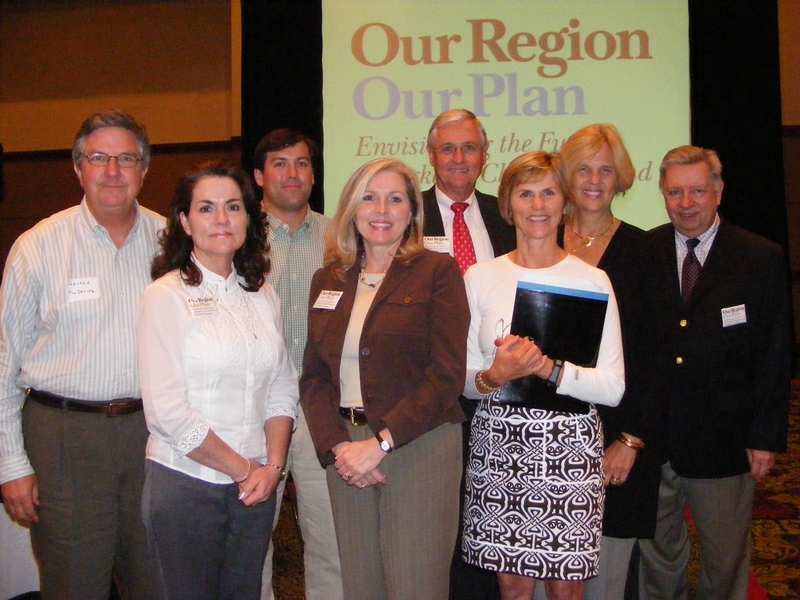 ABOVE: Drayton Hall Executive Director George McDaniel, (far left), and Director of Preservation and Education Carter Hudgins (third from left) attend a regional planning workshop. Thankfully, Our Region Our Plan also draws from other successful models in the country to demonstrate that we can keep our rural areas rural while growing dense urban centers. By using forward thinking zoning policies that preserve the characteristics that we all cherish in our rural lowcountry areas, we can preserve our irreplaceable landscapes. Up-and-coming sustainable developments, like nearby East Edisto, exemplify the kind of settlement patterns that will keep our beloved historic district what it is, so future generations can enjoy it. So what will keep this Plan from just collecting dust on the shelf? The chair of Our Region Our Plan, Councilman Larry Hargett, kept the answer simple. “You and I and our elected leaders will determine this. COG is just here as a reminder.” The political will of citizens has to be a driving force behind the way that our streets, communities and highways are constructed. We have a powerful voice and we have to use it. For this reason, Drayton Hall has continued to stay involved in grassroots planning efforts over the years in order to voice support for opportunities to enhance the rural character of the district, such as establishing public parks at Ashley River Road’s northern gateway in Dorchester County. As is evident in many areas throughout the country, badly planned development destroys the quality of the places where people live, work, and play. The decisions that control this type of growth happen in planning commission and council meetings. We know from this plan that it is possible to preserve our local resources and accommodate for the increases in jobs, housing, and other infrastructure that the area will require. Our Region Our Plan can now be used by citizens to advise our officials in taking advantage of this varied set of solutions for guiding development and investment. Want to help Drayton Hall in our efforts to preserve this beautiful place? Become a Friend of Drayton Hall, or contact our Conservation Coordinator Eugenia Payne at eugenia_payne@draytonhall.org. Your voice matters!